The number in parenthesis after “My Tickets” indicates the number of your tickets that have new unread actions. 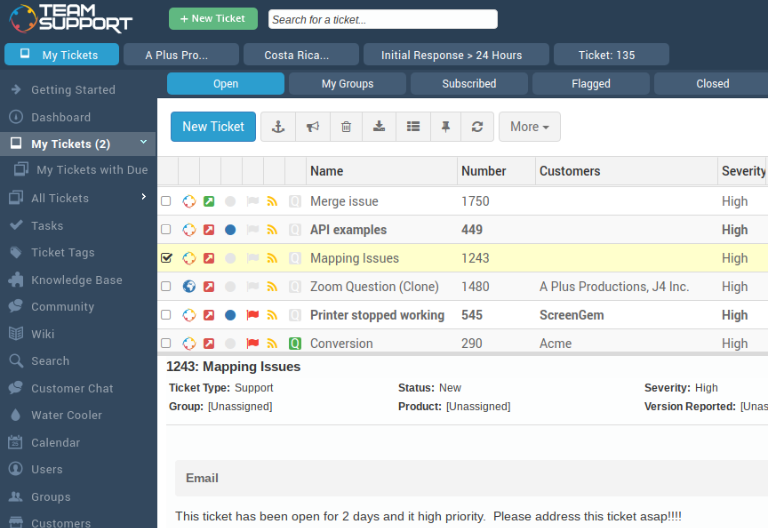 The “Open Tickets” tab shows all of the tickets that are assigned to you. If you click on a ticket, a preview will be displayed in the bottom viewing pane. To open a ticket, click on the green arrow, or double click the ticket. To create a new ticket, click the “New Ticket” button. You can choose which columns you would like to be displayed by clicking the “Select Columns” button, drag and drop to reorder columns, and sort columns in either direction by clicking on the column header. All customizations in the My Tickets section are user specific and will be saved for the next time you log in. Click here for a more detailed description of the My Tickets section. Click here to learn more about Managing your Tickets. Click here to get familiar with Searching.